There is nothing to cry about – Lacrima di Morro d’Alba is a nice and smiling wine! In this weekly column, we hope to lead you to a destination of uncommon pleasure and discovery among the plethora of Italy’s native wine grapes. Home to more grape varieties than any other country, Italy’s wine diversity is often described as endless. 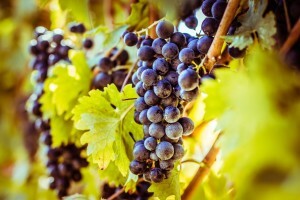 Many of these varieties are so climate specific that they cannot be transplanted to another region, they are better able to cope with local microclimates and express terroir, resulting in wines with distinctive and unique aromas. Nothing, however, is perfect and some interesting Italian vines are trivially underrated due to historical reasons, often being left in the shadows of more famous ones. Fortunately, in the last two decades, this unique abundance is being embraced by growers and producers across the country as they look to revive forgotten indigenous grape varieties and capitalize on the exciting possibilities they offer. Luckily or not, this phenomenon has become a trend and people are now rejecting the so-called big six grape varieties. Lacrima is an Italian dark-skinned grape variety that in past was much more widespread in Campania, Umbria, Puglia, and Marche. It was also used to produce table grapes and was highly appreciated for its very aromatic and richly flavored profile, that shows intense floral and spice characters on the nose with a fresh, berry-dominated palate. The word “lacrima” means teardrop in Italian and is probably referring to the fact that the berries have a tendency to split, dripping juice down the outside of the bunch. This is perhaps one of the reasons that the variety had such a decline in the early 20th Century – the split grapes attract pests and diseases and were largely replaced by grape varieties that were easier to cultivate. Lacrima’s dislike of American rootstocks, widely used following the Phylloxera crisis of the late 19th Century, was also a nail in the coffin for the grape. The Lacrima grape’s ancestry is still debated in the world of vine identification, but DNA profiling has suggested links with Aleatico grape. Nowadays it is grown reasonably widely in the Marche, where it receives a special Controlled Denomination of Origin called Lacrima di Morro d’Alba – named after its place of origin. Moreover, Lacrima di Morro d’Alba should not be confused with the Lacryma Christi (tears of Christ) wines, made from Piedirosso grapes on the slopes of Mount Vesuvius, in Campania. Marche region produces a large variety of wines, 13 of which are carrying the D.O.C. (Denominazione di Origine Controllata) label, which must contain at least 85% of the predominant grape varietal for a particular type of wine. These wines are usually made without refinement in wood, using carbonic maceration technique and being placed on the market in the following vintage, in other words: are fresh wines with intense and unmistakable varietal aromas, of medium-bodied nature. Over time, “Superiore” classification was also introduced, and along with this phenomenon, wines aged in oak with greater structure. The “Passito” classification was established as well, which gives moderately sweet and well-structured wines. The best Lacrima’s labels currently available are being produced predominantly by four producers. The first one is Lorenzo Marotti Campi, with his well-balanced Lacrima di Morro d’Alba Orgiolo 2016, a wine of elegant flowery, black pepper, and red fruit notes with serious tannins. Also of excellent quality is its “younger brother” Lacrima di Morro d’Alba 2017, well-modulated and perfectly balanced, with persistent varietal notes. The second one is Vicari Vini, a historic family-owned estate winery run by the young brothers Vico e Valentina. Their Lacrima di Morro d’Alba Dasempre 2017 has a fruity aroma, in which violets and woodland fruits blend in absolute harmony, as well as a pleasant dryness. Also interesting is their Lacrima of Morro d’Alba Rosé Sfumature del Pozzo Buono 2015, the first lacrima sparkling wine in champenoise method, that has a deep pink color and fruity aromas. Thirdly, Paolo Lucchetti that produces the not to be missed Lacrima di Morro d’Alba Fiore 2017, with an extremely intense and heady bouquet of exotic Eastern flowers with wild strawberries and pomegranate. Once past the intriguing nose, the palate features hints of roses, violets and geranium, a note of pink peppercorn and finishes very fresh with limited tannins. Also interesting is their Lacrima of Morro d’Alba Superiore Guardengo 2016, with good tannin structure, great varietal characteristic and a lot of savouriness. Last but not least, Stefano Mancinelli the “great old man” of the Lacrima territory with his Lacrima di Morro d’Alba 2016, which has intensity and roundness in the nose and mouth, with rose and violets notes. Also very good is his Terre dei Goti 2013 – which doesn’t boast the DOC but is produced exclusively with Lacrima grapes – that has notes of rose, violets, peppers, and over ripened fruit. Maintaining the same quality, Lacrima di Morro d’Alba Passito Re Sole 2013 boosts with a sweet taste that is not tiring at all, with a rich and varied olfactory profile, very intriguing.